The first title match to feature on Sunday 12th November at the Seamaster 2017 ITTF World Tour Platinum German Open has been decided in Japan's favour after the young partnership of Miu Hirano and Hina Hayata successfully captured the Women’s Doubles title in Magdeburg. Miu Hirano and Hina Hayata emerged victorious over Chinese Taipei’s Chen Szu-Yu and Cheng I-Ching across three games to lift the trophy (11-7, 11-8, 11-9). Both sides entered the tie off the back of 3-2 victories in the semi-finals so the title match was expected to be a close contest, but in reality it was a relatively comfortable experience for the Japanese duo. Composed throughout the course of the opening two games Miu Hirano and Hina Hayata then established a commanding 10-3 lead in game three. Remarkably Cheng I-Ching and Chen Szu-Yu saved six match points in a row to narrow the score to 10-9, but a lightning quick forehand across court from Miu Hirano eventually handed the two 17-year-old competitors the win. “We are very happy to win 3-0 in the final to take the title. This is our first time pairing up as a doubles pair so we never thought that we could be the champions on our first outing. Today, I played the banana flick well and Miu’s forehand strokes were also well executed”, Hina Hayata. Victory sees the Japanese duo receive US$ 8,000 in prize money and marks the first title for Miu Hirano and Hina Hayata as a partnership. 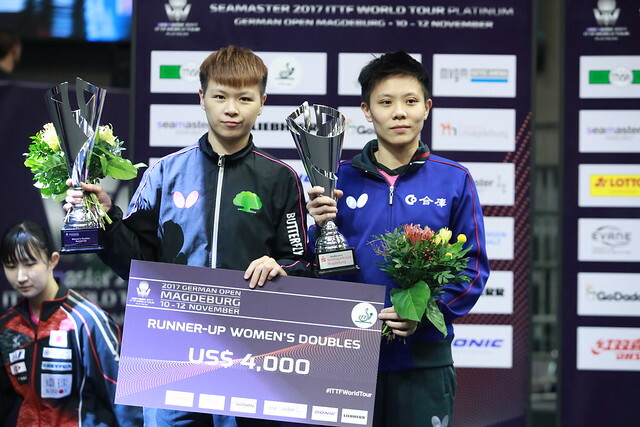 Despite the defeat in Magdeburg Cheng I-Ching holds three Women’s Doubles trophies to her name and the pairing with Chen Szu-Yu most certainly has the potential to succeed moving forwards.